Chef Michael Carrino, chef and co-owner of Pig & Prince Restaurant & Gastrolounge, in Montclair, opens his glorious meat locker and carries out half of a 285* pound Berkshire Pig. He lays the pig on the butchering table, ties on his yellow bandana, snaps on his black latex gloves, breaks out the hacksaw, and goes to work. About every fourteen days Carrino practices this near ritualistic butchering of a Berkshire pig. He harvests specific cuts to be used mainly for curing purposes, but is very methodical and makes every cut with a mind toward minimizing waste. "I use the hams for Jersey Hams, the shoulder for capicola" Carrino says, "the loin for Lonza, the neck for coppa, the belly for pancetta and bacon, the tenderloin for sauccison, the head for head cheese, the feet and bones for stock, the trim and fat gets ground for nduja, sopresatta, truffle salami, and sausage meat for the risotto." Carrino has been working with breeder, LL Pittenger Farm, for over six years, and visits the Andover farm at least twice a month to check on the pigs and look for specific characteristics. "If I pick them as piglettes," Carrino says, "I choose the longest and leanest ones; this produces more bacon and lonza." Carrino is passing on his knowledge and passion to his staff at Pig & Prince, but does so with patience. "I try to teach my sous chefs how it is done. It will take a while to learn, as it did for me, and since each one is so valuable to us we make sure that who ever is butchering the animal understands the level of respect that must go into the process. This animal was raised for food and we owe it to the animal to utilize it completely without waste." 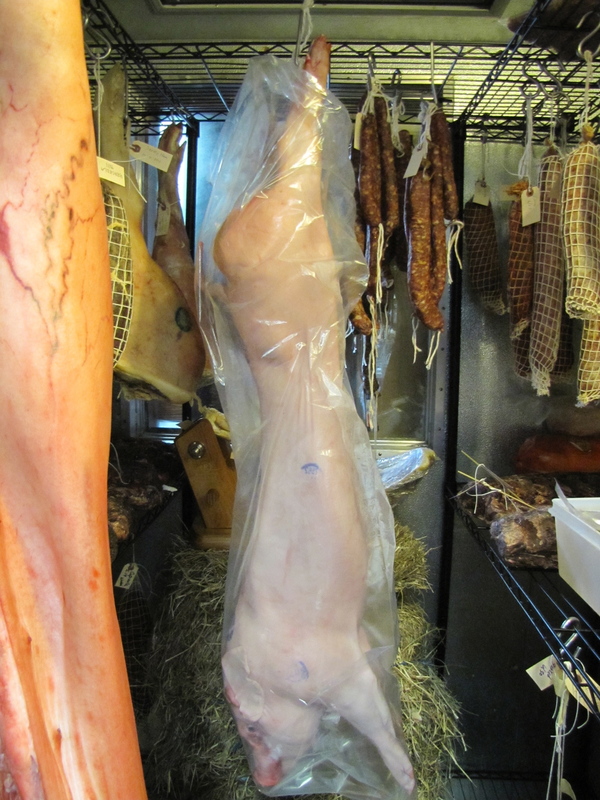 Click play for a quick peek inside the Pig & Prince kitchen on butchering day.